I really enjoyed this story’s no nonsense heroine, hot and super-cool hero with a hilarious sense of humor, premise and surprising secondary characters. The mystery kept me turning pages almost as much as the 'will they or won’t they' romance. It’s not the same old thing. Mucho awesomeness! 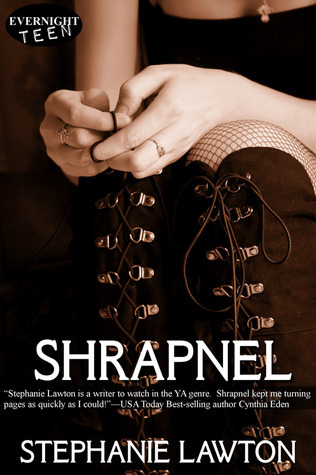 Sign into Goodreads to see if any of your friends have read Shrapnel. Sounds like an absolute must read !! It really is. Have you read her book 'Want' yet? It's one of those 'where have you been all my life' books. :) I gave 'Want' 5 stars because it was just that good. Heinzypop wrote: "I have not read Want yet but you know how it gets with so many other books getting in the way but I'm going to get it soon though it's been on my wishlist since you first read it :)"
I know exactly what you mean. You will enjoy it, though, whenever you get to it. Bring a box of Kleenex! Julie wrote: "It really is. Have you read her book 'Want' yet?" After Want, I definitely read her other books. And your review made me want to read this more.